The educational structure of holding managers on family farms in Slovenia is unfavourable, since as many as 83 % of managers have only practical experience in agriculture. Younger holding managers are better educated; 17 % of holding managers younger than 35 years have completed some level of formal education. Generally, the education level is improving quickly – in only a three-year period, the share of formally educated holding managers on family farms increased by more than 10 %. The amount of training on agri-environmental measures is constantly on the increase. In the 2001-2004 period, the agri-environmental programme was attended by 53,700 participants. Such training promotes environmentally-friendly methods of farming, re-orientation into ecological and integrated crop production and participation in agri-environmental measures. The indicator presents educational levels of holders and managers of agricultural holdings in Slovenia based on the completed formal education and agricultural training. Their favourable age and educational structure is one of the important factors contributing to more efficient management of agricultural holdings, because well educated, innovative and aware farmers find it easier to adapt to the modern economic, environmental and social conditions. Agriculture has an impact on the state of natural resources, therefore it is essential that farmers take the principles of good farming and environmental practice into consideration. Educational programmes on agri-environmental issues teach farmers to practice effective environmentally-friendly farming methods. 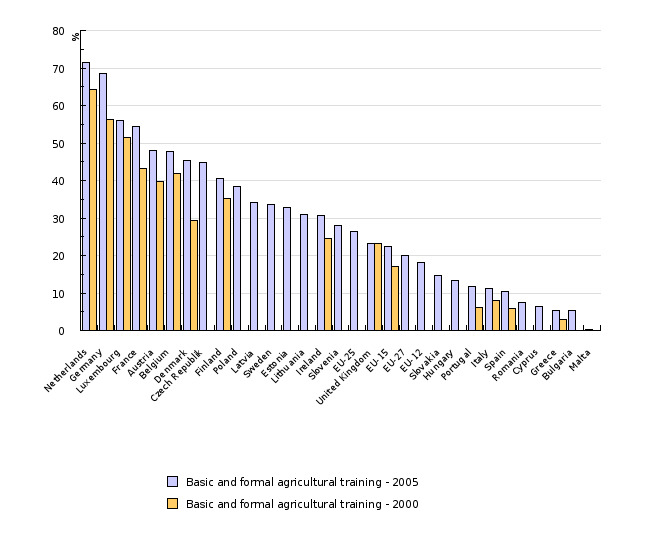 As an indicator, the number of participants in these training programmes does not denote a direct correlation between the degree of the completed education and environmentally effective measures of agricultural policy; however, it does indicate the willingness of the decision makers on agricultural holdings to participate in the training actions and to introduce environmentally friendly farming methods. Statistical Office of the Republic of Slovenia, Structure of Agricultural Holdings 2000 in 2003. 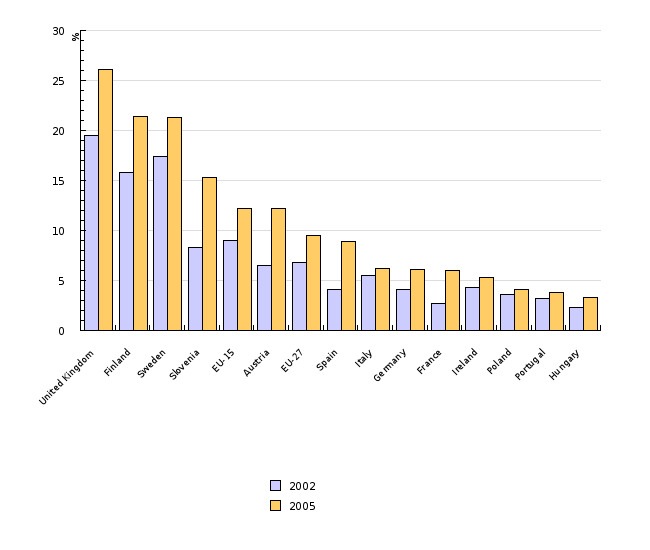 European Union, Directorate General for Agriculture and Rural development (2007): Rural development in the European Union, Statistical and Economic Information. Improved competitiveness of the farming and food processing industry, and sustainable management of rural areas and natural resources are two priority tasks of Slovenia’s agricultural policy. The general goal is a better educational level and a balanced development of Slovenian regions. As the goals are not set in a quantitative manner, it can be said that the increasing number of participants in educational training based on the agri-environmental programme results in the improved educational structure in the countryside. The specific goal, therefore, is to increase the number of participants in this programme. 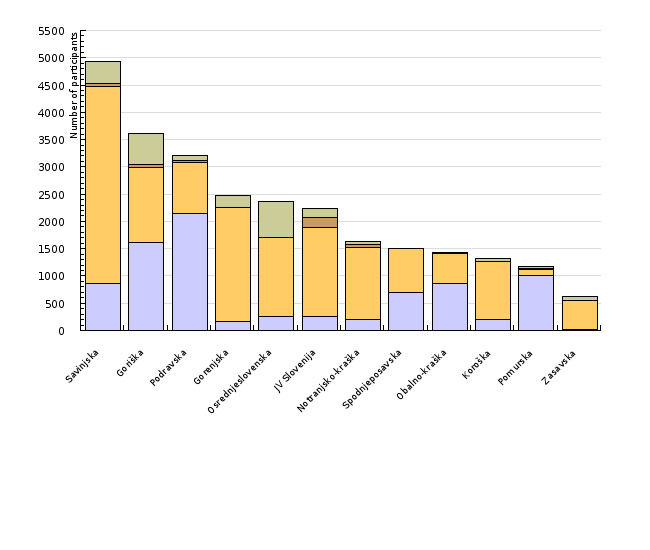 The educational level on Slovenian agricultural holdings is rather unfavourable. According to the survey of agricultural holdings from 2000, the number of holding managers in Slovenia was 86,336. As many as 72,440 holding managers (85.8 %) had no formal agricultural training and only had practical experience in farming. 7,045 holders (8.3 %) completed basic courses in farming, and 4,982 holders (5.9 %) had formal agricultural training. In 2003, a sampling survey of the structure of agricultural holdings was carried out. The number of holders decreased to 77,037, and their education slightly improved. The number of holders with only practical experience in farming decreased to 83.0 %. The educational structure of holding managers varies significantly among individual age groups. 43 % of managers aged 64 years or more have only finished elementary school, while the number of such managers younger than 35 is only 3 %. Similar statistics apply to vocational agricultural training: only 2.7 % of holding managers in the age group of 64 and above have at least vocational agricultural training, while the share among younger holders exceeds 17 %. The educational structure of holding managers is comparable to the EU average. Some Mediterranean countries, too, have a prevailing share of holding managers with only practical experience in agriculture. In Austria, which has a similar agricultural structure as Slovenia, the share of managers with elementary and formal agricultural education is 40 %, while in Slovenia it is 17 %. In terms of the rural development policy, training is organised for all farmers included in the Slovenian Agri-Environmental Programme. During the five-year commitment, farmers have to complete at least one 15-hour educational programme and take part in at least one presentation. In the 2001–2004 period, 53,700 farmers took part in training actions by the Slovenian Agri-Environmental Programme. In 2001 and 2002, there were 7,124 participants, while in 2003 their number increased to 20,071 due to a larger number of measures and improved information-sharing. 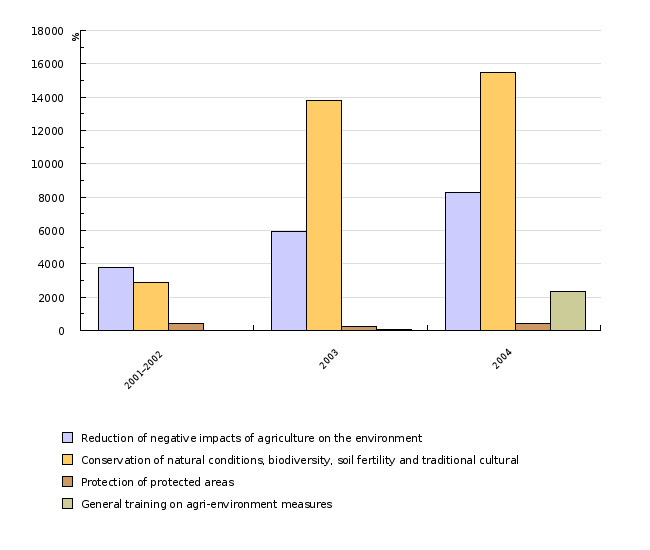 In 2004, when all 21 measures by the Slovenian Agri-Environmental Programme were implemented, the number of participants in training actions increased to 26,505. Almost half of all training actions were carried out due to the measure concerning sustainable breeding of farm animals (48.4 %), which is the most widespread method, followed by measures concerning integrated winegrowing (11.2 %) and organic farming with 6.6 %. The basic data sources are studies on the structure of agricultural holdings carried out by the Statistical Office of the Republic of Slovenia. As in other EU countries. they are carried out periodically every three years. Comparable data of the complete agricultural survey in Slovenia in 2000 and the data from the sampling survey in 2003 are available. Data on training in accordance with the Slovenian Agri-Environmental Programme were acquired from individual data by the Ministry of Agriculture, Forestry and Food. Even though the indicator is not coordinated with the EU-15 indicator definition we believe that our information has the necessary quality, as it indicates the number of participants by individual years and individual measures.